Nocona still makes a boot the way your great grand-daddy expected them to be made. John Justin passed this company to daughter, Enid, who passed it back to John, the son, etc. Even today, the tradition continues. 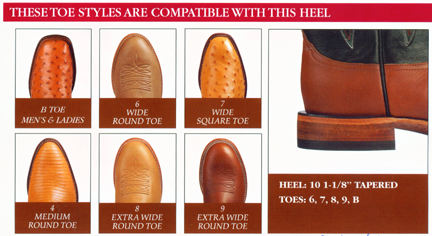 When ordering any Dealer's Choice boot, the boot number should reflect your choice of heel and toe designs. The last three digits of the Dealer's Choice boot number are reserved for the toe design (first number) and heel design (last 2 numbers). Nocona has lasts in their manufacturing to allow these toes (1, 3, 4, 6, 7, 8, B, & L) to go well with this heel (03). These are the most popular combinations, so Nocona Boot made a commitment to keep each last in each size for you. Nocona has lasts in their manufacturing to allow these toes (4, 6, 7, 8, 9, & B) to go well with this heel (10). These are the most popular combinations, so Nocona Boot made a commitment to keep each last in each size for you.